It was February in Washington DC, days after the start of a very (to put it mildly) “turbulent" new Administration. It was gray and cold and I was very worn out, awaiting another surgery for my cancer treatment. Oh, and there were 2 angsty teenagers at home struggling through homework overload. BUT I had the chance to go to Palm Springs CA for a blogging/new media conference - Alt Design Summit, so I got out there as fast as I could! 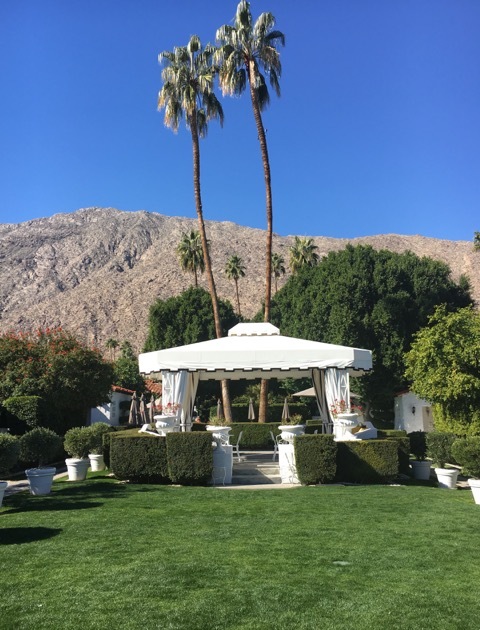 Beyond the amazing weather in Palm Springs, my spirits were immediately lifted when I checked into the Avalon Palm Springs, designed by Kelly Wearstler Her optimistic, playful, retro/futuristic style was the best infusion of energy or medicine I could have! As you may know, Kelly designs everything from houses to hotels to lighting to yes, even fashion. I’ve always been an admirer of hers but seeing her work on her home turf - California - where she knows exactly how to create a fully immersive happy & seductive stageset - NOW I really see her magic. She is a wonder worker for the soul! I’m now back home, oohing and ahhing over her book Hue. If you have a minute, or $20, get her book and go on a mini-journey right from home. Or throw in a saucy color into your home that you wouldn’t have thought of - citrine, moody charcoals, even a piquant orange that she sprinkles in. Or if all else fails, hang a big blown-up photo of you and your favorite person at the beach. Somehow, some way, if you are in the winter doldrums, you’ll find that Kelly has all the answers to shake you out of it. Enjoy! !